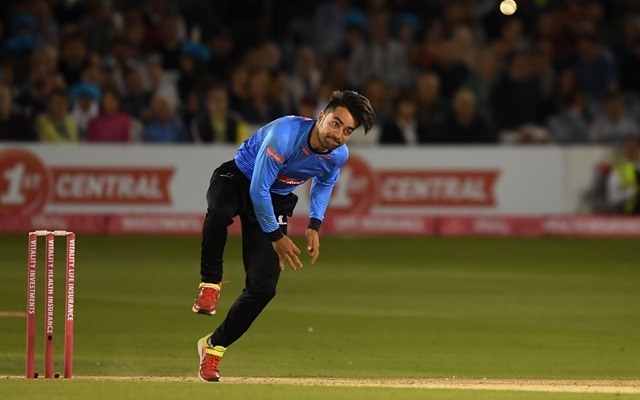 Rashid Khan will be once again seen playing for the Sussex Sharks in the next season of the T20 Blast. He has signed a deal with the club to be available for the first half of the competition subject to international clearance. He was part of the same team this year as well and played the whole league stage for them. Sussex also qualified for the quarter-finals thanks to the Afghanistan leg-spinner who kept on picking the wickets in the middle overs for his team. The leggie scalped 17 wickets in 11 matches at a brilliant average of 14.35 and was miserly as well conceding runs at an economy of 6.59. Interestingly, he was earlier signed to play the first half of the tournament even this year but then after opting out of the Caribbean Premier League (CPL), he decided to extend his stay with Sussex and played a crucial role in helping them reach their first knockout game since 2015. Rashid Khan was delighted to sign the same team again for the next edition of the T20 Blast and also wished the team all the luck for the finals day. Sussex won their quarter-final encounter against Durham and will now face Somerset on the finals day on September 15. “I’m so happy and pleased to be back with Sussex in the 2019 T20 Blast. I had the best time this year; my teammates, the coaching staff and the management staff were amazing. I really enjoyed my stay and can’t wait to come again and play for Sussex next year. I was really pleased to see the team qualify for the quarter-finals and then to the Finals Day. I wish them the very best of luck; I hope they do well and win the title for Sussex. Come on Sharks,’ he said in a video message. I’m absolutely delighted. I can’t speak highly enough of the young man, his performances and how he fitted into our dressing room. He was brilliant for Sussex. I’m jumping for joy at the prospect of having Rashid back for us next year,” he was quoted as saying by Cricbuzz.